According to GreenBuildingAdvisor.com, about a third of your total energy spending is wasted on leaky and drafty windows. You can lower your energy costs by replacing these damaged units with St. Charles Missouri energy efficient windows. Opt for replacements that use high-performing glass options. The most reliable ones feature low-emissivity (low-E) coatings that keep heated or cooled air inside the home. We spend a lot of time at home. That’s why we have to make sure that the air we breathe indoors is clean and toxin-free. In the United States, the highest st andard for indoor air emission is set by the Scientific Certification Systems (SCS). The SCS issues the Indoor Advantage Gold™ certification to window companies whose products pass their strict requirements. Many replacement units are designed to improve air quality inside the home. You should look for this certification when picking out replacements. Windows have always had an important role in the overall design of your home. Being a prominent part of the architecture, they can make a big difference in terms of curb appeal. The right ones can add drama and character, helping your house st and out from the rest in the neighborhood. You can get both beauty and energy efficiency in the composite Fibrex® frames manufactured by Renewal by Andersen®. They have been engineered to look as exquisite as wood, minus the dem anding upkeep. This material has superb thermal properties and can insulate around 700 times better than aluminum. A special process allows the frame to be infused with long-lasting color that doesn’t need to be scraped and repainted every few years. Renewal by Andersen is one of the few window companies to have received Gold certification from the SCS. They use energy-efficient High-Performance™ Low-E4® glass on all their replacement units. This is covered with multiple layers of low-E and spectrally selective coatings that help keep indoor temperature at comfortable levels, no matter the weather outside. When used with Fibrex, this glass option can help lower your utility bills by 25%. 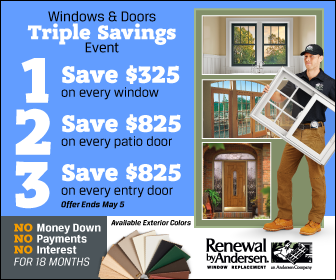 We at Renewal by Andersen of St. Louis are the experts in windows installation St. Charles MO residents have been turning to for years. No other replacement unit gives better value for your money than our windows. Talk to our experts about installing one for your home. Give us a call at (314) 332-2364 today to schedule an in-home consultation.